MIKE VON ERICH HAND SIGNED AUTO PHOTO. DAVID VON ERICH HAND SIGNED AUTO PHOTO ALSO WITH REFEREE DAVID MANNING ON THE BACK. DAVID MIKE KERRY KEVIN BANDANA SOUVENIR FROM LATE 70'S EARLY 80'S MID-SOUTH WRESTLING. This is 5 DVD set of DAVID VON ERICH. Sold from one collector to another. 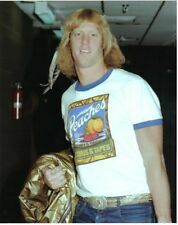 BEST OF DAVID VON ERICH VOL. David Von Erich vs Destroyer #2. David Von Erich vs Tim Horner. David & Kerry Von Erich vs Killer Karl Krupp/Gene Yates. Up for sale is the JULY 1983 issue of "SPORTS REVIEW WRESTLING" Magazine! "SPORTS REVIEW WRESTLING"! JULY 1983! THIS IS AN 8 X 10 PHOTO. IT IS FRESH, CRISP AND MINT. I AM LIQUIDATING MY WRESTLING PHOTO COLLECTION. ALL PHOTOS ARE SOLD FROM ONE COLLECTOR TO ANOTHER WITH NO RIGHTS GIVEN OR IMPLIED. BUY 4 PHOTOS AND GET 1 FREE. This magazine is in very nice condition for its age; front and back covers show minor wear, and the outside corners of the magazine are a little creased/bent. A Young David Von Erich In Singles Action. David Would Be Only 19 Here And In His First Full Year Of Pro Wrestling. Small Tear At The Top. Overall, Decent Shape. Up for sale is a pre-owned Sports Review Wrestling September 1982 David Von Erich Nick Bockwinkel. HERE IS THE JUNE, 1984 ISSUE OF "THE WRESTLER", WITH DAVID VON ERICH ON THE COVER. Wrestling World Spring 1982 that is in FN (Approx 7.0) condition. This is a great collectible piece with the Iron Sheik on the front cover and worthy of your consideration. FREE Trial! This magazine is in very nice condition for its age; front and back covers show minor wear, and the magazine is a little curled along the binding. It's in really nice condition. David Von Erich and Billy Jack Haynes. From the popular "Wrestling Scene" magazine. HERE IS A JULY, 1978 ISSUE OF "THE WRESTLER" MAGAZINE, WITH ANDRE THE GIANT AND BOB BACKLUND ON THE COVER. THE COVER IS IN VERY GOOD CONDITION, WITH VERY CORNER BENDS. THE INSIDE IS EXCELLENT. This magazine is in very nice condition for its age; front and back covers show minor wear. The magazine is in good shape. The inside pages has yellowed with age. This is a complete magazine. I try to be as accurate as possible, but it is only my opinion and should in no way be considered as an appraisal value.